The next time you grumble as you have to be the one in your house to tie up the plastic garbage bag and wrestle it out of the garbage can to carry it to the garbage bin, which is conveniently located next to your garage…please stop and think of this. 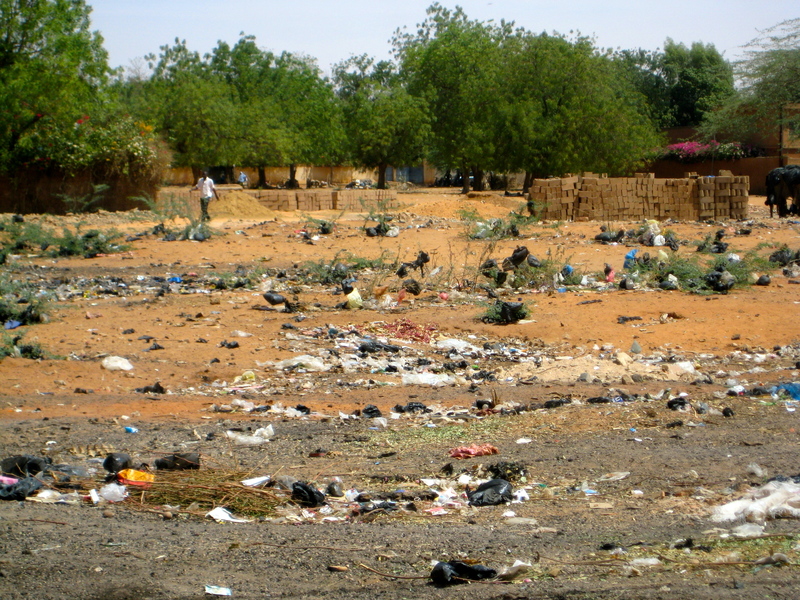 In Niger, there are no garbage bins next to garages. There is not a company that drives by to pick up garbage and take it to a landfill for a small monthly fee. There are matches. And there are mounds. EVERYWHERE. Yes, in Niger garbage is burned. Anywhere and everywhere! The smell of fire is in the air always, and I am getting used to it. I am getting used to the sight of little burned mounds all over the place, with wild goats rummaging through to find the least-charred items for their dinner. I thought of this as I was resting today, the smoky smell wafting in through our heavily-screened window. I thought about what a normal part of life it is, this smell, now that I’ve been experiencing it for almost two months. How quickly we get used to something! I bought three apples yesterday for about two dollars. I can’t stop thinking about it! Here is how it works… First, we get ourselves “ready” for the market on mondays…making our list, part of it is for us, and part of it I write separate so I can tear it off and give it to our “local guy” who helps us get some of the produce…but wait, I am getting ahead of myself. We have to get there and find a parking place near the market. Usually a guard waves his hand and whistles (literally, a gym-teacher’s style whistle!) us toward a spot that takes a miracle to squeeze into. Once our feet hit the ground, we are surrounded by lots of things: smells, noise, venders, the guards, and our aforementioned “local guy”, who promptly takes my torn-off list and heads into the market to find the things I’ve listed. Now we are on our own quest for the remainder of the prepared list. The “list” is oh-so-important. You see, upon arrival to the Petite Marche there is no room for thinking afresh. It is a survival situation for us. the onslaught of stimulus is so intense that it takes all of me to just complete the list! Past the countless shacks and stalls and piles on the ground, searching for the right opening into the market so we won’t get lost in there. Watch out for “the trench” — don’t step in it or on it! God-only-knows what is in there, and by the looks and smell of it I DON’T WANT TO KNOW. Carefully step over it and move on. All this time there are these precious children everywhere. Offering to help carry our bags. Offering to sell us something completely useless. Asking for food. Asking for a “cadeau”, a gift. Children of all ages. I want to cry right now just thinking of them…while my own children lie snugly in their cozy beds, my loving kisses still fresh on their cheeks. It is SO HARD for me to walk away from them! I want to hold them and tell them how much Jesus loves them and I want to give them what my own kids have — love and trust and hope! Lord, help me! I really want to DO something! These are YOUR kids! You love them! You made them! The advice of the other missionaries here is to be careful with your gifts to the poor. I get that. The physically poor are everywhere here. You have to be wise and discerning, decide what your “policy” is and stick to it. This is very sound advice! These are Godly men and women, sharing their hearts and experience with us! So we walk on. Oh okay, Andy breaks down each week and “hires” this sweet little 10 or 11-year old boy to carry our bags to our car. (for about 50 cents) This little guy finds us each week among the throngs of people! It is amazing! Sometimes I just want to go crazy and just see what would happen if I let all caution go to the wind and just buy some food for the kids! Or take their hands and tell them that Jesus loves them! I want to throw out all the wisdom I’ve received and abandon myself to the compassion I feel. So… yesterday I did. Three apples. Oh for once I am just going to lose myself! I wanted to cry. Oh how I wanted to tell those first two …”Jesu, t’aime“… Jesus loves you. My idea failed. I just wanted to show some love, a practical gesture of God’s generous love…*sigh*…I have so much to learn here in this foreign land. But I also felt liberated! It doesn’t work! Ha! I just had to try! My heart bursts with love and compassion for these kids, yet God has His own ways…and I must wait for Him to show me what to do or say. Oh Lord Jesus, may I follow You wholeheartedly and abandon myself to Your marvelous love! I want to love this dirty, messed-up world in a way that honors and glorifies Your Name. Teach me Your ways that I may walk in Your truth, give me an undivided heart that I may fear Your Name.